This post is part of a brief series on Paul Draper’s Plantinga Lecture “God and Evil: A Philosophical Inquiry”. 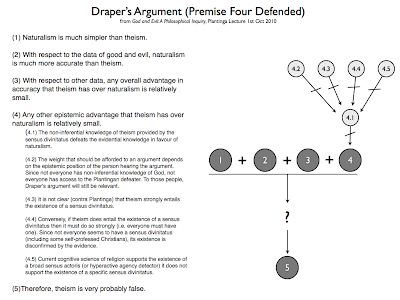 In previous entries, I set out the basic structure of Draper’s argument, summarised the analogy he uses to illustrate some of his key points, and considered his defence of the first premise of his argument. In this entry, I focus on Draper’s defence of premises (2), (3) and (4). There’s nothing too surprising about Draper’s defence of this premise. Anyone who has read his classic 1989 article will be familiar with the basic contours of his thinking on this matter. In his lecture, he defends the premise by telling a story about two alien scientists who come to earth: Natty, the naturalist, and Theo, the theist. As they investigate the world, these two aliens acquire more and more data about good and evil. As they do so, they will try to make predictions about what they will learn about the conscious beings (those capable of experiencing pain or harm) who inhabit the earth. Draper argues that Natty will be far more successful in making predictions about these conscious beings, and the fates that befall them, than Theo. For instance, Natty will be able to infer that the fate of conscious beings will be similar to that of unconscious beings such as plants. Why? Because on Natty’s worldview there is no reason to think that conscious beings will be treated any differently from unconscious beings: both are subject to the same process of evolution. On Theo’s worldview there is some reason to think they will be treated differently since conscious beings are capable of being morally wronged. Similarly, Natty will be able to infer that pain and pleasure are likely to be largely fitness-tracking experiences (i.e. tied to evolutionary success). Theo will be unable to make that inference because he has reason to think pain and pleasure will have some sort of deeper moral significance. Of course, Theo can respond to both of these examples by playing the skeptical theist (ST) card. He can claim that he doesn’t know of all the entailment relations that can hold between possible goods and evils and that it is possible that God has some sort of “beyond-our-ken” reasons for allowing what we observe. There are two points to be made about this kind of response. First, it does nothing to undermine premise 2. Anyone who adopts the ST-response must tacitly admit that naturalism is more accurate with respect to the data on good and evil. Second, at best this kind of response can be used to protect the other epistemic and evidential advantages that theism might have from being undermined by the data on good and evil. The problem is that ST might not be very successful in doing this. Indeed, it may come with significant epistemic costs of its own. This would actually have the effect of strengthening premises (3) and (4) of Draper’s argument. (I have written about these problems extensively on this blog). A theist could also appeal to a theodicy in response to the problem of evil. Draper does not explore this possibility in his lecture, but suggests (maybe jokingly) that he will in his forthcoming book. (2.1) The naturalist can make better predictions with respect to fates of conscious and unconscious creatures. (2.2) The naturalist can make better predictions with respect to the biological function of pleasure and pain. (2.3) God could have beyond-our-ken reasons for allowing the particular distribution of goods and evils that we see. 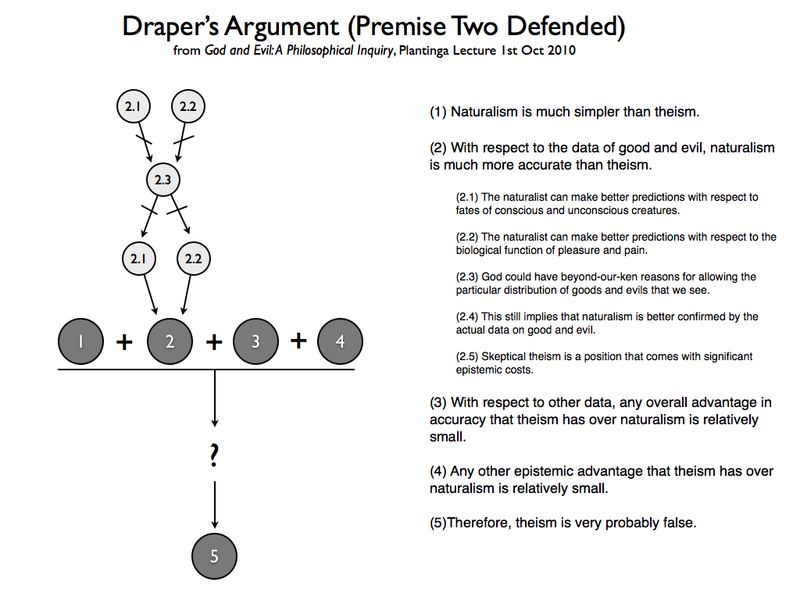 (2.4) This still implies that naturalism is better confirmed by the actual data on good and evil. (2.5) Skeptical theism is a position that comes with significant epistemic costs. All of which gives us the following addition to our original argument map. As Draper notes in his lecture, this premise is crucial and yet incredibly difficult to defend (or, indeed, reject). It suggests that in order to properly evaluate the success (or failure) of the problem of evil we must be able to say that theism and naturalism are roughly equally probable with respect to other available data (or, better, any advantage that theism might have must be outweighed by the disadvantage is has with respect to the existence of evil). It’s difficult to say anything more conclusive about that here. Draper notes that there are several interesting routes that an objection to this premise could take. Perhaps fittingly, he focuses in his lecture on the Plantinga-style objection. Plantinga argues that we have non-inferential knowledge of theism thanks to the presence in us of a special faculty called the sensus divinitatus. 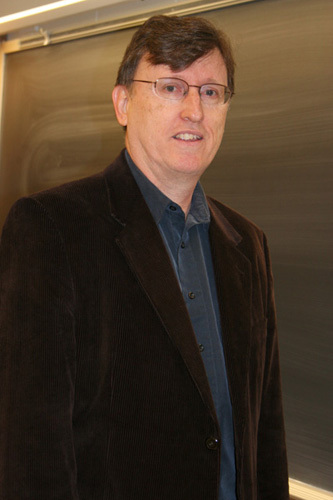 He also argues that the knowledge provided by this special faculty might function as a defeater to any inferential or evidence-based justifications of naturalism. (4.1) The non-inferential knowledge of theism provided by the sensus divinitatus defeats the evidential knowledge in favour of naturalism. (4.2) The weight that should be afforded to an argument depends on the epistemic position of the person hearing the argument. Since not everyone has non-inferential knowledge of God, not everyone has access to the Plantingan defeater. To those people, Draper’s argument will still be relevant. (4.3) It is not clear (contra Plantinga) that theism strongly entails the existence of a sensus divinitatus. (4.4) Conversely, if theism does entail the existence of a sensus divinitatus then it must do so strongly (i.e. everyone must have one). Since not everyone seems to have a sensus divinitatus (including some self-professed Christians), its existence is disconfirmed by the evidence. (4.5) Current cognitive science of religion supports the existence of a broad sensus actoris (or hyperactive agency detector) it does not support the existence of a specific sensus divinitatus. 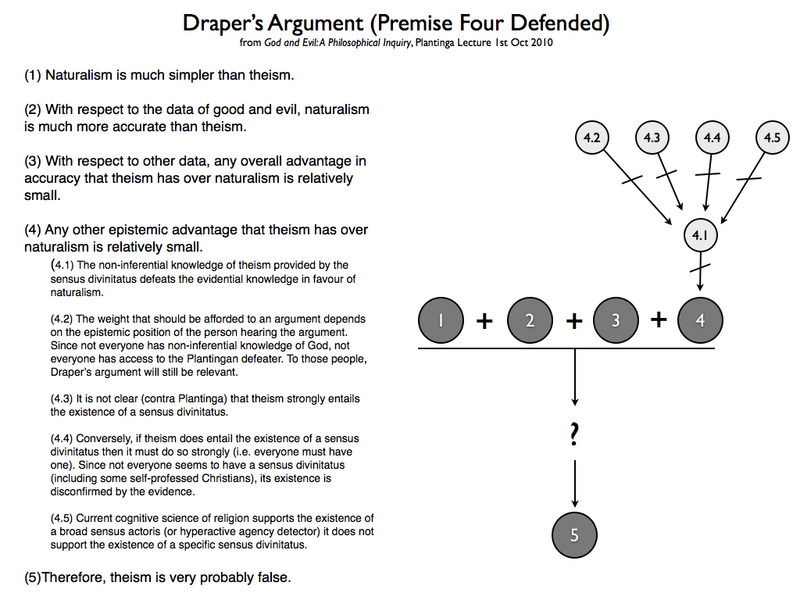 Before adding these points to the argument map, I should note that Draper goes on to suggest that (4.5) might not be that strong an objection since monotheism seems to survive defeaters better than animism or polytheism. 3. Does the Conclusion follow? (5) Therefore, theism is very probably false. 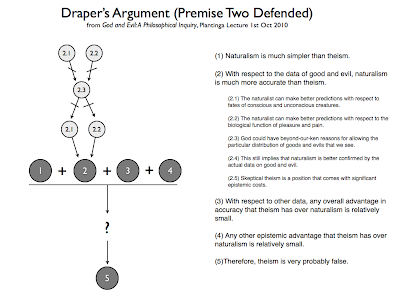 If premises 1 - 4 are true, then it follows that naturalism is more probable than theism. But naturalism is just one of the ways in which theism can be false. Thus, the falsity of theism must be as least as probable as the truth of naturalism. But then it does follow that if naturalism is much more probable than theism, then theism is very probably false. Why? Because the falsity of theism must be at least as probable at the truth of naturalism, and maybe even more so. Very interesting, I'll be anticipating this book. The force of his Natty and Theo example would seem to apply only to the existence of death and evil, though, and would seem to remain pretty inconclusive unless you presuppose that Natty and Theo are already naturalists about their own origins. Supposing that this alien species had sufficient scientific knowledge to know that a naturalistic account of consciousness is possible, I would still guess that they would fall on the side of assuming that the human race was a creation of another alien race, or something like that. That's because they would probably already have the technology to be able to create/simulate other intelligent species by that point, and so for them the chance that a new species would be created would be much higher than that one would make it through the long slog of evolution. This is a variation of the simulation argument.